The five-episode, eight-hour series Eight Hours Don't Make a Day is a fascinating forgotten effort from the insanely prolific Rainer Werner Fassbinder (Fox and His Friends, The Bitter Tears of Petra von Kant). Originally aired on a monthly basis during the fall of 1972 and the winter of 1973, the series was a commission by left-leaning TV network WDR to create a show around underrepresented working class characters. Dubbed a "family series," with episodes named after each of the show's romantic couples, Eight Hours shows Fassbinder combining his fondness for soapy Douglas Sirk melodrama with the more issue-driven kitchen-sink agenda that the network laid out for him. Gottfried John, of many later Fassbinder productions (as well as Goldeneye, for all you James Bond-spotters out there), is the working class hero, Jochen. He's a bit cleverer than his fellow workers at the tool manufacturing plant, but he's not interested in showing up his colleagues and/or transcending his vocation. He's simply talented and happy -- for the most part. In the first episode, we meet Jochen's whole family, but most importantly, the women in his life. Fassbinder might be best known for his beleaguered, tortured heroines, but he limits Eight Hours to just one: Jochen's sister Monika (Renate Roland), who is trapped in her marriage to abusive authoritarian Harald (Kurt Raab, who previously played a messed-up dude in Why Does Herr R. Run Amok?). The two other central women in the show, however, are strong, willful go-getters. 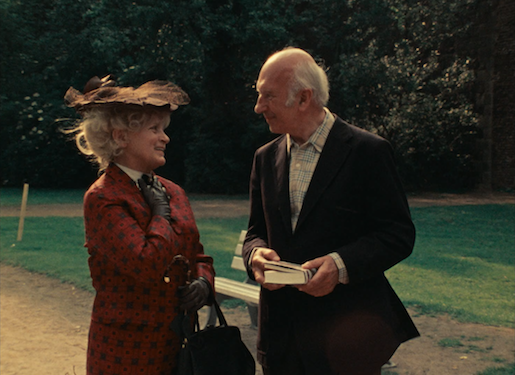 Marion (Hanna Schygulla, The Marriage of Maria Braun) meets Jochen while beating up an automat for not dispensing a jar of pickles (the first of many scattered objects throughout the series which get inflected with surreal humor). He tries to convince her she needs a man's cool head to what she wants, as he finesses a jar from the dispenser. The argument appears to be won, until Marion scores her own jar through pure force of will (and a good slap). Instantly, her role as the one to push Jochen beyond what is comfortable in the name of what's right is set -- and they haven't even started dating yet. Jochen's grandmother, known only as Grandma on the show, is played by veteran Luise Ullrich. She's spunky and stubborn, but it's not just an affect; it's rooted in her opposition to conservative authority and her refusal to accept that "that's just the way things are." When Grandma and her sweet but shy new boyfriend Gregor go looking for a new apartment, she frustrates any number of would-be landlords just for offering to pay them what she and Gregor can actually afford, as opposed to their more exorbitant rates. Later, she gets even more radical by deciding to turn an abandoned public library into a kindergarten for neglected neighborhood kids, even after city officials have explicitly forbidden it. When Grandma and Gregor are arrested for their actions, the affected families band together to get the kindergarten reopened. This theme of working together to improve everyone's lot runs through the series. Jochen and his work colleagues face numerous challenges from upper management, including the retraction of a work bonus, the company's refusal to hire a foreman from within the workers' ranks, and a decision to move the factory out of town. If it's not one thing, it's another; but Fassbinder refuses to let the characters totally surrender to despair or apathy. When the few are able to convince the many to work together on the problems, Fassbinder rewards them with some sort of satisfying solution. Some leftist critics of the series have claimed that the methodology Eight Hours describes is little more than wishful thinking, but only the most bull-headed pundit can find fault in the impulse to inspire viewers to do something about their problems. Detractors were probably not thrilled either with Fassbinder's refusal to go for "realism," in the vein of, say, Ken Loach. Instead, his scripts were written and his camera was choreographed with poetry in mind. Throughout the series, there are many striking tracking shots; one extended overhead shot, following Jochen as he gets signatures on a petition from all his coworkers on the factory floor is an unparalleled technical marvel. 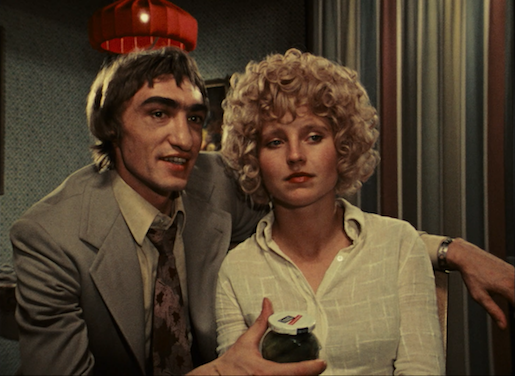 Fassbinder's use of humor tends toward the bizarre also: a man is handed a rose to give to the object of his affection, but instead he eats it; at Jochen excitedly runs down a stairwell, only to collide with himself against a mirrored wall. Countless scenes of drunkenness culminate in silly, nearly nonsensical back-and-forths between characters. 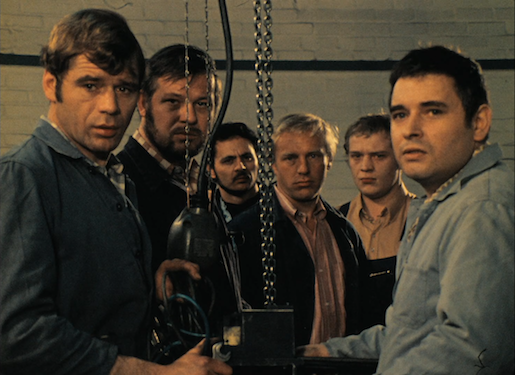 There's a welcoming warmth to Fassbinder's vision of the working class world, but there's plenty of unvarnished oddness as well. This oddness is key to the appeal of the show, beyond the well-realized characters and button-pushing subject matter. Fassbinder doesn't just use Eight Hours to dare us viewers to be creative and active, he is constantly daring himself as well. Eight Hours Don't Make a Day is presented on two Blu-rays. A fold-out, including an essay by Moira Weigel, is included. Unfortunately, here is an area where corners appear to have been cut, to broaden this release's appeal. There are five, roughly 105-minute-long episodes of Eight Hours Don't Make a Day, and rather than spread them out on three discs, as Arrow did with their Region B release, Criterion has gone with a more consumer-friendly two-disc option. As such, the AVC-encoded 1080p 1.37:1 transfer, which is sourced from the same new restoration as Arrow's, is slightly inconsistent encoding-wise. While the image is generally strong, with no noticeable damage and only occasional hairs in the gate or mild density issues as disruptions, disc one has a much lower average bitrate to accommodate 5-plus hours of show on one disc. This results in a less sharp and frequently noisier image than disc two. In motion, it's not the worst distraction, but for viewers who like to watch things big and/or up close (I watched this show on my home projector), the limitations are apparent. A satisfying restoration of the German LPCM mono audio (with optional English subtitles). Dialogue is always clear (and sometimes obviously post-synchronized). Not a ton of atmosphere or depth, but what is there is well-supported. Occasional musical interludes and stings also sound just fine. Eight Hours Don't Make a Day: A Series Becomes a Family Reunion (HD, 42:01) - A newly produced documentary, looking back at the making of the series, the controversy it stirred, and its legacy. Jane Shattuc on Eight Hours Don't Make a Day (HD, 19:30) - Shattuc, who wrote a book Fassbinder's television work, breaks down the style and storytelling strategies of the series. Rainer Werner Fassbinder is the kind of filmmaker to inspire intense fascination and fandom. For those die-hard fans, this forgotten mini-series is sure to be welcome and maybe even an unexpected revelation. For once, Fassbinder's fascination with Sirkian melodrama and sensitive humanism leads him in an oddly optimistic direction, rather than down the road of shattering bleakness (although maybe this is just because the show stopped short, before its intended 8-episode run was complete). Criterion's package isn't perfect (it really would have been better to have three discs instead of two), but it doesn't lessen the impact of this wonderful show. Highly Recommended.